I’m a little behind on my Finished Object posts … so I’ll post a couple projects today, all of which were completed BEFORE the first Fiber Factor Challenge. Next week, after the results of Challenge #1 are released, I’ll be able to share that project (whee!). In the break between challenges, I’ve finished off three personal projects — I’m writing posts NOW and scheduling them for release once a week while I’m needles-flying on Challenge #2. Without further ado … lookit, I made stuff! 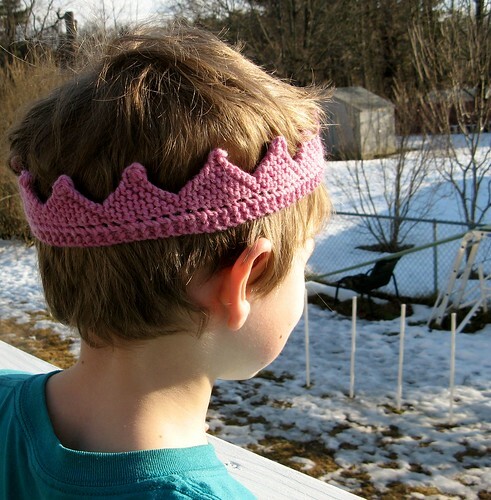 This is a clever little pattern — easy and quick, with deceptively simple design. Among other things, I love how the “points” are a larger circumference than the elastic headband — which means it lies flat when on a surface, but is snug when worn. Brilliant! 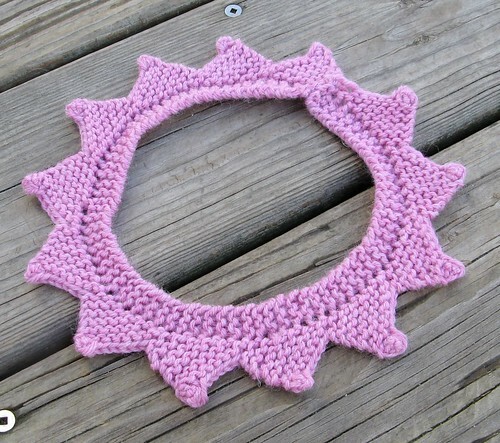 I made this for my friend’s little girl Susan, who requested the color pink :). I made this as a store sample for the Hub Mills Store. I literally BEGGED to make something out of Lima when it first arrived … and then proceeded to take a year to finish this project. Simply put, I am not good at finishing mostly-stockinette projects. I have to say, the fit on this is a little weird … but it’s incredibly warm, soft, and cozy. It’s better than a snuggy for knitting! I’m counting down the six-month waiting period until I get it back from display in the shop :). 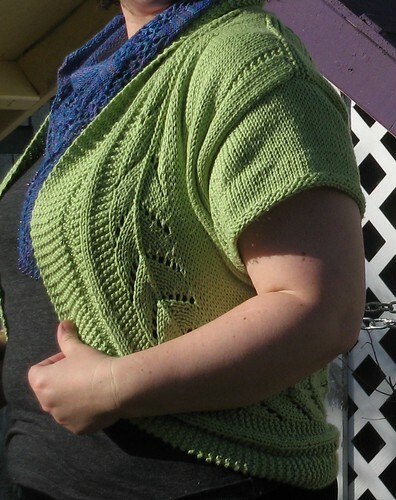 I’ve had this shrug in my Ravelry queue for a loooong time. I bought the yarn, and put it on a shelf. 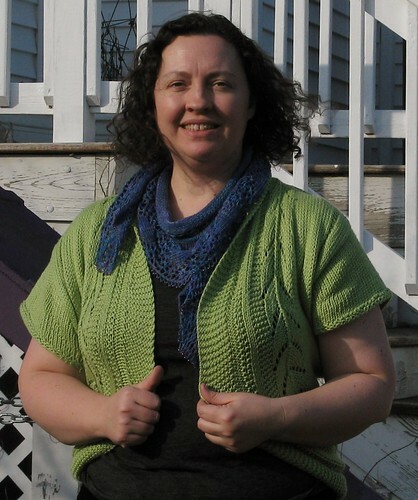 The longer I had it around, the less I loved it … and the pattern appealed less and less too. But the most stubborn part of me wanted to complete a DROPS pattern — notorious for the density and brevity of their instructions. I have to say, the pattern was “complete” in the sense that all the information to make the shrug was contained in the solid little paragraph of instructions … but I had to do a lot of expansion and math to make the knitting do-able. I think in a print-only world, this would be fine … but in the internet era, I prefer slightly more expanded directions. 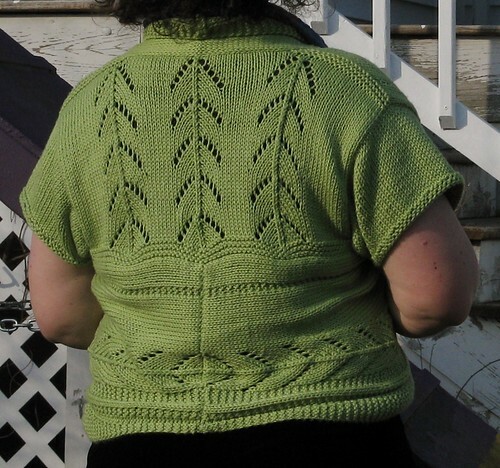 The shrug is knit in two mirror-image curved pieces that form the fronts — they are joined at the back neck and the lower back in a circle. 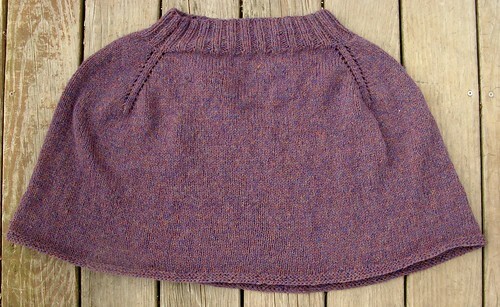 The rectangular piece spans the circle, and sleeves finish the garment. The curved fronts are created with calculated increases/decreases and short rows, all while keeping up with patterned columns AND a lace panel. The “other side” has the infamous “reverse shaping” direction — which isn’t terrible when it’s just armhole shaping, but in this case I found it to be a bit eye-popping. 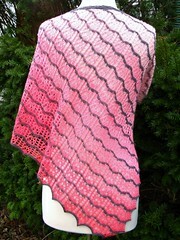 Still, I can now say I’ve completed a DROPS pattern … and I understand why only the most intrepid knitters venture there. The shrug is beautiful! I agree with you about DROPS;) The designs are great, but the patterns need to be exploded a bit before using them. Thank you! 🙂 It’s a shame about DROPS, really, because the style makes them inaccessible to many knitters.